Musicians have always been great fodder as the subjects of film biographies, whether they be fictionalised retellings such as the likes of Walk the Line and Ray or documentary productions such as the recent Cobain: Montage of Heck or Amy, the subjects are chosen for reason beyond the music that they have created. There is always a much bigger story at play as talented individual’s battle to overcome all manner of personal and/or professional demons, not always with success. Sometimes, these stories end tragically, while others result in stirring fight backs from the edge of oblivion as our heroes resurrect their lives and their careers. 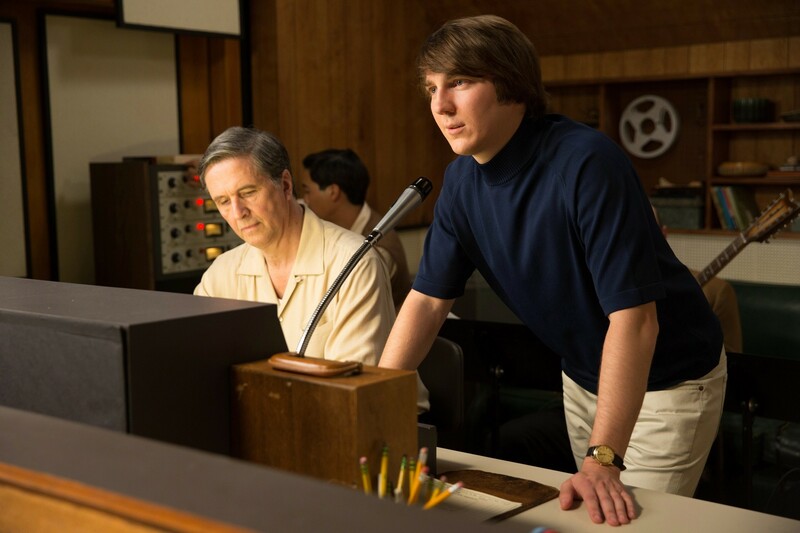 The latest addition to this genre is Love & Mercy, a film that explores the life (or parts thereof) of Beach Boys founding member and all-round musical legend Brian Wilson. The parallel narratives examine two very specific periods in Wilson’s life, specifically the 1960’s and the 1980’s. Like many of those chronicled on film before him, such as Johnny Cash and Amy Winehouse, Wilson is an artist blessed with immense talent but plagued by psychological and emotional shortcomings that have threatened to destroy much more than his career. Like Winehouse, Wilson surrounded himself with people whose motives were in complete contrast to his best interests and, as such, this influence played itself out in ways that pushed him to the brink. However, unlike the British chanteuse, Wilson has been able to avoid capitulation to the forces determined to destroy him and has, like Cash before him, been able to emerge to the embrace of a career revival that puts his music at the forefront of his public profile. For the uninitiated, Wilson is the man responsible for almost the entire Beach Boys catalogue, including their smash hit Good Vibrations, the protracted recording of which is covered extensively in the film and demonstrates emphatically both Wilson’s undeniable genius and capacity for eccentric behaviour. To his great credit, producer-turned-director Bill Pohlad has refrained from excessive use of Wilson’s songs, for the most part utilising them only when they serve the narrative. Paul Dano and John Cusack play Wilson at the two stages of his career and whilst both men are excellent, it is Dano who really shines as the younger incarnation. With the band enjoying great success, the stress of travelling and performing live has left Wilson wanting out of touring, preferring to concentrate on writing new music. However, with his ideas putting him increasingly at loggerheads with the rest of the group, tensions rise and Wilson’s inner demons – in part due to physical and psychological damage inflicted by an abusive father – overwhelm him and lead to the breakdown in his relationships with the band and his family. In the 1980’s, Wilson is under the control (quite literally) of unscrupulous psychotherapist Eugene Landy (Paul Giamatti). Suffering from auditory hallucinations but diagnosed as a paranoid schizophrenic by Landy, Wilson is under constant surveillance from bodyguards and consumes massive amounts of psychotropic drugs prescribed by the dodgy doctor that ultimately cause the onset of a neurological disorder. Despite this, he meets and falls for car saleswoman Melinda Ledbetter (Elizabeth Banks) and it is she who ultimately plays a very significant role in freeing Wilson from Landy’s grasp. Giamatti is so oh-so-effective in his portrayal of Landy, a man so rude to everyone around him that you just want to punch him in the face. Whilst not blessed with the opportunities afforded her male co-stars, Banks is fine enough as Melinda, to whom Wilson remains married to this day. The fact that you can’t tell whether the filmmakers have simply inserted Dano into historical concert footage of the band, or whether the scenes have been completely reproduced from scratch, is testament to the overall quality of the production. The decision to focus on two distinct periods of time is also the right call as Love & Mercy doesn’t suffer as a result of trying to tell a story that, in its entirety, is simply too long to fit a feature film format. Despite the fact that Dano and Cusack don’t look much alike, the combination works well and the colour palettes provide a clear distinction between the two eras. Pohlad has also created a soundscape in which the aural elements serve to heighten our sense of connection with Wilson. We hear what he his hearing, or at least that is how it feels. 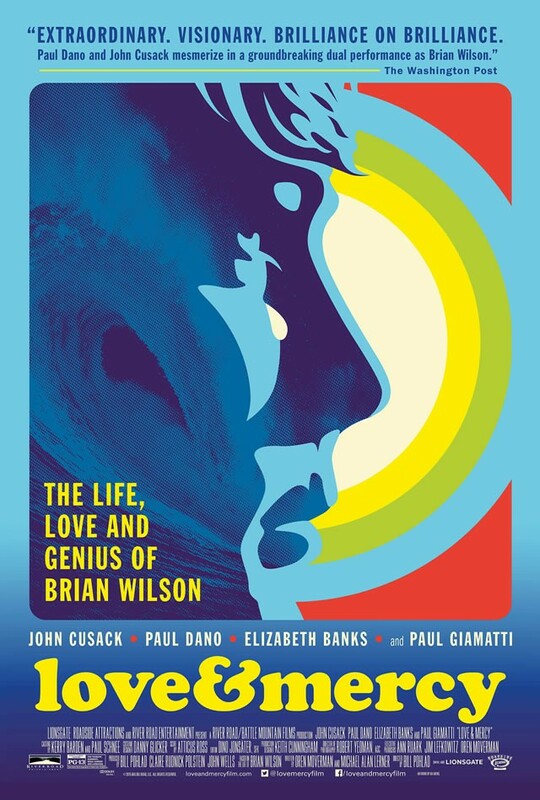 It is unusual to see a movie as uncompromising as Love & Mercy while the subject is still alive because, whilst Wilson is certainly a sympathetic figure, it doesn’t always show him in a flattering light. It is certainly fitting though that, as the credits roll, we see the real Wilson performing the song from which the film’s title is taken. This is a terrific biopic that might (should) bring some award season recognition for the two men who have so effectively captured the talent and torment of this most enigmatic artist.